What do you mean I’m on Fortune? I did a double-take. Fortune? Like the magazine? 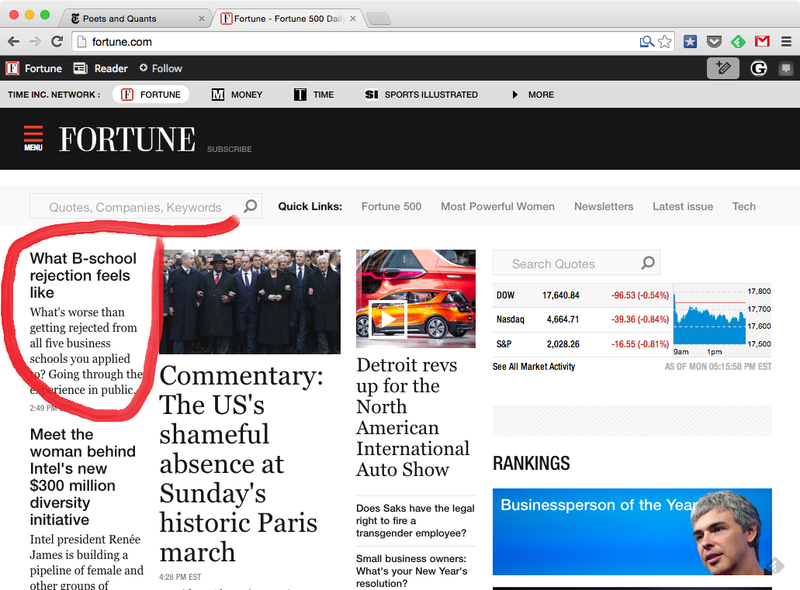 Here’s the back story of how I ended up on Fortune’s front page. 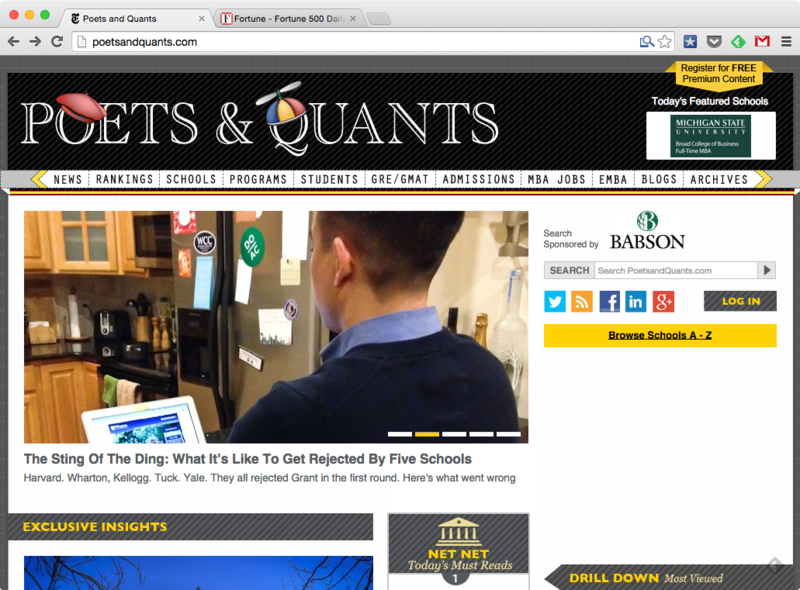 I was contacted by Poets & Quants last week to do an interview regarding my MBA experience (with the focus being on how I was unable to receive one acceptance from any of the five schools). The 90 minute conversation was pleasant, all be it slightly painful. I had yet to do my post mortem on my application experience, and here I was…. reviewing myself in front of someone (over the phone). After recounting my experience, interjecting stories and laughter in an otherwise gloomy story with a known ending, I asked for feedback on my writing. The interviewer Ethan gave me great feedback and encouragement (hopefully I will be putting his advice to work). The phone call ended on a happy note, as I articulated that my last blog photo was not a “desolate desert that represented the barrenness of my life without MBA accomplishments,” but rather it was Mars, “a whole new world foreign to me, ready to explore.” I hung up, got back to work, and pretty much forgot about it. A week later I saw my post on P&Q’s facebook. I went to the webpage and saw the the picture to the right. I proceeded to go to the post and read it (I loved it by the way). (It was then picked up by Fortune.) The P&Q story was the same, but told from a different perspective, and the writing was well beyond anything I have ever been able to put together. Then I read the comments. First of all, I am really going to start focus on quality writing in my posts (instead of just pushing pieces out). Operationally this means eliminating some adjectives and adverbs while boosting my verb variety. Strategically this means I will be re-examining myself and how I view my plan to go to a top school. Feedback is always important to me. This blog will continue, and I hope that it continues to help others. Complete my post mortem on why I didn’t get into school (and post it). Start studying to get a 760 on the GMAT in May. Start interviewing my network and new friends on schools and how they think they were able to get in. I will also be doing a few more interviews (maybe) in the future with other organizations/media. Who knows what the future holds??? GrantMeAdmission: The Results are In! Congratulations man. I think now you have to accomplish more as more people are getting inspired and more people want you to be successful. All the best. Keep it up. Happy writing! Haha… famous in a VERY niche market perhaps… Thanks for your support through the whole process; it means a lot to me! First of all, thank you for your support and for following my blog. I am glad you have found it useful. Second, I think consultants are in a tough position. I was happy with my consultant, and I believe the experience added value. I just think i have more work to do. Haha; thanks for the support! I found your blog via P&Q – I read the comments regarding MBB recruiting on your “Method to the madness” post from another user and have to disagree on the point that once you get the interview, it’s on you to get the job and not where you went to school. Observing my classmates recruiting at Johnson, you can’t tell me school prestige isn’t a factor. Year after year Tuck easily sends 20+ interns to Mckinsey and Bain each, while we struggle to get ten combined. I just don’t think it’s that Tuck students are better prepared every year, Tuck just has more clout with MBB and when you’re putting over 20 new alums at each of the MBB firms every year and Johnson is getting 4-7, well, it’s not hard to see how the relationship with MBB gets stronger with Tuck with so many alumni and remains relatively weak at Johnson. Another caveat is that just because MBB recruits at a school, doesn’t mean all offices are on the table. That’s a big thing to consider. Schools love throwing the MBB names on their “who recruits here” page on the interwebs. At Johnson, our best ties to McKinsey is at the Pittsburgh office and with Bain at the Dallas office. I’d imaging at the Tuck, Wharton, and Kellogg tier, all the offices are on the table. This is something else to consider. Long story short: If you’re focused on MBB, you’re right to want to go to schools that have the highest placement. No, not even HBS can guarantee a slot at MBB, but you’ve got to feel like you have way better access, since MBB consulting is very prestige driven – the top tier schools place better at those firms year after year and it’s not an accident. Thanks for this comment JohnsonMba. Very informative. I think you need to open separate blog for this topic:) Would be very interesting. Usually current students avoid criticizing their programs strengs and weaknesses. Thanks for your honesty. I noticed your blog on fortune, I don’t think you need an MBA, personally, I think MBAs are overrated. You are persistent and have the ability to create & add value, why don’t you try starting a business? Then you can hire MBAs to do what they do. I have a MEng in Eng Management, if I wanted to join a top program it would be related to tech/design/innovation/engineering, the world needs more of those. One of the best pieces of advice I received from an Adcom was to not try and interview a bunch of people to see why they got into a top program. They will be speculating at best. Don’t try to be somebody in your applications. Just be you. Show the Adcom who you really are. Show them a clear history and a clear trajectory. Don’t just check things off a list. Instead, tie everything together to present a clear story of who you are, where you came from, where you are going, and how an MBA fits into that picture. You need to show what you will get out of a school’s program, but also what you will bring to that program. Also, you sound a little cocky making an assumption about your future GMAT score, and you are also setting yourself up for disappointment if you miss your mark. Sorry about the rejections- you’re clearly a talented guy who deserved to get at least one admit based on your effort. I recently applied and will be attending a top 10ish school (think Yale, Michigan, Berkeley) but similarly got a lot of flat out rejections from many of the same schools you applied to. I didn’t see this advice in any of the other comments on this post or others, so I thought I’d share in the hopes that it helped. A lot of your posts mention setting massive hours goals for each MBA activity ie GMAT prep, program information compilation, interview prep. Have you considered making your goals more encompassing of both quality and quantity? I ended up with a 740 on the GMAT which was about the minimum score that I was willing to apply with, and I found that many of my friends who set hours objectives didn’t end up meeting their underlying goals. Instead, consider more of a mix between quality and quantity eg “go through all MGMAT prep books once, do every problem in the Official GMAT prep guide until you can get 80-90% right on the first try, then take the MBA.com practice tests (there are 4 if u buy the extension pack) and retake them until you can get a 740+ consistently”. I found that this was successful for me, and it makes it so that, rather than running out the clock, you’re orienting yourself towards objectives in a way that makes you feel confident that you’re being efficient with your time. I probably spent 150 hours altogether in my GMAT prep (half your 300 hour goal), but I can vouch for the quality and planning of those hours and it was never about the hours at the end as much as the results of my practice test scores followed by revision, restudying, and retaking. Sorry for the long post, but the second piece of advice builds off the first. Consider taking a “good enough” attitude towards elements that are less important to your admission’s outcome. Instead of setting massive pre-research goals for each program (30 hours each), it might be more pragmatic to set good enough goals since at the end of the day, there are diminishing returns to knowing every detail of every program and I found that I came off as obsessive in interviews when I knew too much. It was more than enough for me to attend an info session and talk to 1 person from each school before applying (and then mention these actions in my essays). As far as the interviews, if you apply to 6 schools, I might aim for 1 practice interview for each actual interview you do and simply writing out your specific answers for each interview in advance so you can effectively do the “Why MBA, Why X School, Why X Career” bit in a specific manner. Just wanted to share in case it helped. Best of luck next year and feel free to reach out if you have specific prep or program questions. Thanks for the feedback; I really appreciate it!